THE NEW EDITION OF THIS BOOK. 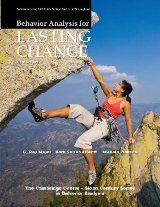 Sloan Publishing is proud to announce the publication of Behavior Analysis for Lasting Change, Third Edition by G. Roy Mayer, Beth Sulzer-Azaroff, and Michele Wallace. This comprehensive introduction to the field of behavior analysis has been completely updated and references thousands of scientifically-supported constructive solutions within hundreds of areas of human performance.